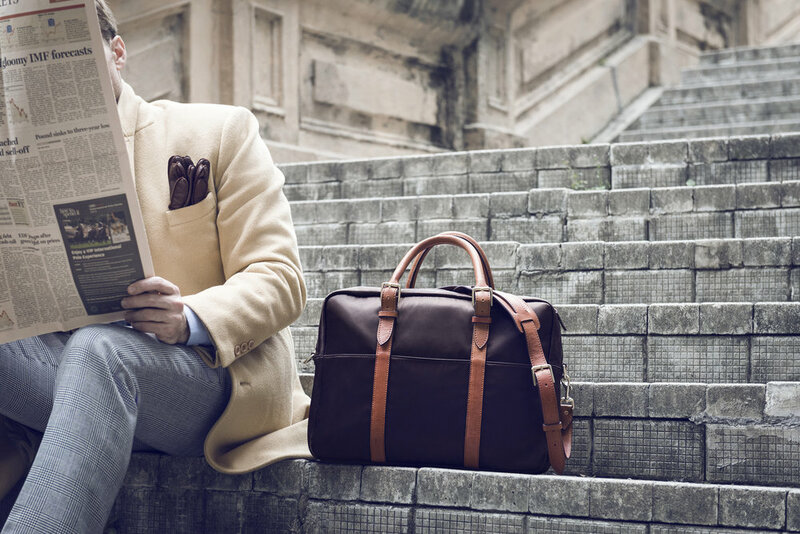 Disclaimer: Stuart & Lau was kind enough to send The Peak Lapel this briefcase for free for the purposes of this review. Certain products sometimes just stand out as being exceptionally. They perfectly hit the point between price and quality, and bring you the absolute most value for every dollar that you spend. I’d been looking for a great briefcase for a while now, but I didn’t want to break the bank. A couple hundred dollars? Sure. Closer to a thousand dollars? No thanks. When, through a series of coincidences (a story for another time!) Stuart & Lau’s co-founder offered to send over one of their Cary Briefcases in Olive and Black ($295), I was more than excited to take a look. And, like I said at the outset, was utterly blown away by just about everything about this bag. So, with that being said, let’s get into it. This bags both beautifully and incredibly thoughtfully designed. It’s no surprise at all that it recently won Wirecutter’s top pick for a briefcase. It manages to be both modern, and timeless all at once. The main parts of the bag are made out of a wonderful, waterproof canvas. The handles and all straps are made out of leather. This two-tone look and texture is quite cool and of-the-moment, but also timeless in its own way. In short, this is a damn good-looking bag. That being said, some of the color combinations are likely better and more “cool” than others. I think the navy and tan is absolutely killer. The olive and black bag that I have I think is pretty great, but not quite as awesome. And so on. Still, this means that there is something for everyone. If you want to keep it all one color, and stay even more conservative, you can certainly do that as well. In all, no matter which one you pick, this is a great-looking back, so you can’t go wrong. On top of that, it’s also quite slim, yet holds a lot. Yes, there are definitely smaller, thinner, and lighter bags out there, but, for the amount of stuff you can fit in this bag, it’s remarkably low-profile. It’s not super thick or bulky in any way, and it’s quite reasonable to hold and carry around and still look sleek and neat. Then there are all the incredibly smart design details. There is the standard removable shoulder strap, but there is also so much more. Each bag comes, for instance, with not only a leather luggage tag, but a stylus/pen that clips on to anywhere you’d like around the bag. Additionally, and perhaps the coolest feature, is that they also include a leather key fob that has a magnet inside. This allows you to magnetically attach the keys to an area inside the bag so that your keys don’t fall to the bottom, get lost, and cause you to dig around trying to find them. Lastly, outside the bag are two adjustable leather straps, perfect for holding an umbrella or newspaper. Another cool details? Sure! Stuart & Lau’s logo is subtly and tastefully “hidden” in various parts around the bag. You’ll find it on the zipper, the key fob, and so on. Inside the bag, the good design continues, with a leather pocket at the top, perfect for a wallet, keys, credit cards, or headphones. There is also a soft-lined area for a laptop, as well as two rows of pockets. One is stretchy, and is perfect for your chargers and cables, and the other side are just standard, deep pockets, great for pens, and so on. There are also more pockets on the outside, one of which closes magnetically, the others of which are just standard pockets. Needless to say, there is a ton of room for stuff in this bag. I got all the contents of my old backpack into this briefcase with plenty of room to spare. Some minor quibbles: For one, I find the pockets very deep on the inside, making it hard to retrieve things that are small, and slide to the bottom of the pockets. Two, the magnetic attachment for the key fob often disconnects, as the magnet is not strong enough to hold the keys up. This could just be me, though, as I have about 4-5 keys on the fob typically. This bag is super sturdy, and feels like it is made to last. The canvas is thick and serious, and the leather is high quality and rigid, but breaks in nicely with time. The zippers and clasps are all super high quality, very durable, and super smooth to use. Every last detail about this bag feels super premium, and nothing feels remotely cheap. The one downside? This bag, likely because of all the parts, is quite heavy. So, even when empty, you’re starting out with a pretty heavy bag. The more you put in it, the heavier it becomes (obviously). After a laptop, a notebook or two, chargers, pens, and so on, it could get to be quite a few pounds. So, bear that in mind. If you’re looking for a super lightweight bag that is barely there, this is not at all that bag. This is an everyday carry type bag, with room for everything, and then some, while still retaining a reasonably slim and sleek profile.